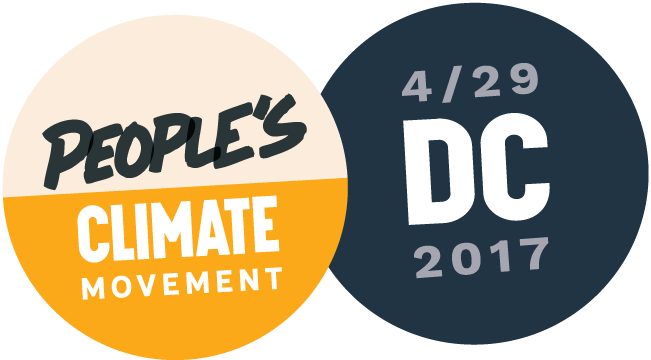 350 Philadelphia invites you to join us on Saturday, April 29th in Washington, DC as we take part in the People’s Climate Mobilization! 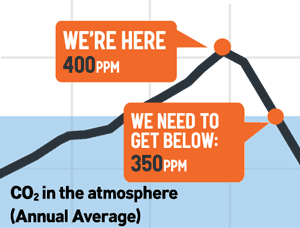 We, along with tens of thousands of other people, will be marching to call for a rapid and just transition from fossil fuels to clean, renewable energy. Our contingent will link up with other groups from the Philadelphia area, and we’ll carry beautiful puppets, banners, and signs created by our art team. If you can’t make it to DC on the 29th, we encourage you to join the local sister march that our friends at Philly With Standing Rock are holding that day. You’ll find more info at the bottom of this page. PennFuture & League of Conservation Voters have reserved charter bus that will depart at 6am. Tickets are $50. Megabus has scheduled buses that will depart from 30th Street Station at 5:45 and 6:45, and 8:30am. Round-trip tickets start at $23. RallyBus has scheduled a bus that will depart at 6:45am. Tickets are $65. Chestnut Hill — This bus, organized by PA Interfaith Power & Light’s Philadelphia chapter, will host an interfaith Shabbat Service during the trip to DC. Departure time is 6:10am, and tickets cost $45. Eastwick (SW Philly) — Bus organized by the Sierra Club, departs at 6:53am. West Philadelphia — Philadelphia Muslim Contingent Bus (people of all faiths welcome), departs at 8am from 4700 Wyalusing Ave. Tickets are free, but donations are encouraged. Students at Swarthmore College are inviting community members to travel with them on one of the three buses that they’ve reserved for the march free of charge! 11:00am: We will gather in front of the Capitol Building in contingents that spell out the values we share: justice, truth, democracy, faith and more. Our 350 Philly contingent will be a part of the “Reshapers of Power” section of the march. We will meet in front of the Capitol on Jefferson Drive between 3rd and 4th Streets. To see a map of the full march line-up, click here! 12:30pm: We’ll begin marching up Pennsylvania avenue. 1:30pm: We will surround the White House on all sides, and take powerful collective action to honor the lives at stake and make a loud sound demanding climate justice and good jobs that will drown out all of the climate-denying nonsense that has been coming out of the White House. 3:00pm: We will reconvene at the Washington Monument grounds to connect and share the stories that brought us to DC. We’ll hear from the front line of the climate crisis and share solutions rooted in our own communities. There’ll be music and beautiful art from around the country that powerfully shows our local demands and visions. We’ll even assemble all our individual signs into one collective message of resistance. See our calendar for ongoing art builds. 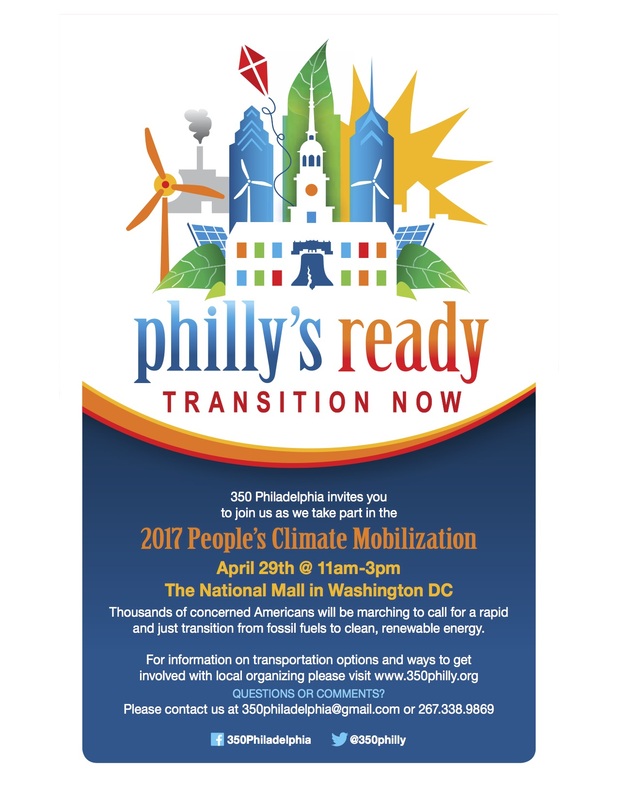 Since January, members of 350 Philadelphia and other local organizations as well as dozens of new volunteers have been working together to promote the march. So far our work has focused on brainstorming ways to encourage people to attend the march, designing artwork, and organizing methods of transportation to and from DC. We still need volunteers to help with outreach, art creation, building actions, publicity, fundraising, and other activities. Contact 350philadelphia@gmail.com for more information on how to get involved! Please help spread the word about the march! Click here to check out our Facebook invitation. Printable flyers are available for you to pin to bulletin boards, take to meetings, etc. Share away! Click here to learn more or to sign up to participate.